Hello all! In this special update I would like to officially welcome our new Xbox One players! 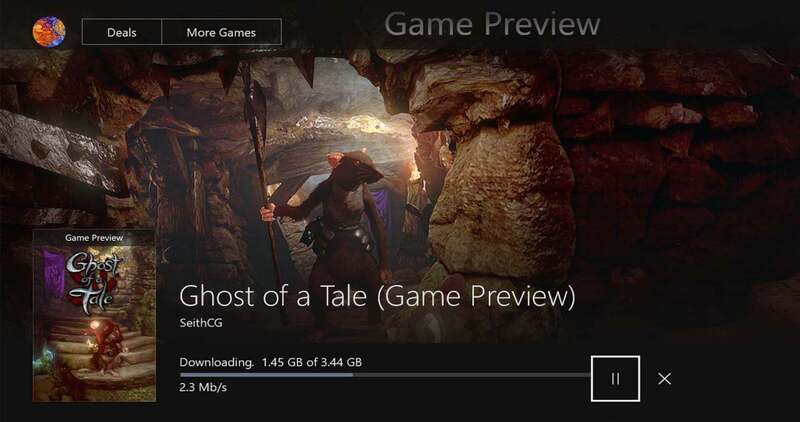 Ghost of a Tale has indeed landed on the Xbox One store (in the Game Preview section) today, Friday June 30th. Note: if you backed the game during the Indiegogo campaign and you would like to receive an Xbox One token then please send us a message at: contact@ghostofatale.com from the email address you used during the campaign (that’s important!). What does “Game Preview” mean? It also means that as players you get to influence the game’s development by giving us feedback and reporting bugs. And because the game is not finished yet it is of course sold at a lower price than the final version. Obviously, when the final version arrives your Preview version will get upgraded at no additional cost to you. Update: The new build is live, as well as the free one hour trial! You can now experience Ghost of a Tale on Xbox One as we intended from the beginning. Unfortunately we didn’t manage to upload the latest build on the servers in time for the launch so what you’ll get at first is an older build (4.0). Since then we have fixed dozens of bugs (both large and small), vastly improved the visuals (textures, lighting, shaders, models, etc…) and done a big optimization pass (framerate stability). The new build (4.35) should become available as soon as Microsoft can disseminate it to its servers. Which we hope will be done in a few hours. On a technical note: if you buy the game at launch today, please wait for the game to finish downloading entirely before you press the “Launch” button. If you press it as soon as it appears (roughly at 25% of download progress) then the game probably won’t even start or will freeze before you can start playing. It’s no big deal though, you’ll just have to quit the game and simply wait for the download to complete. Then you’ll be able to launch it again and everything will be fine. Please don’t hesitate to post your suggestions/technical issues on our forums. Ghost of a Tale is out on Xbox One and PS4! New website! Simultaneous Xbox One & PS4 release! Ghost of a Tale on consoles, more music! Ghost of a Tale is out on PC!! How exciting! Congratulations Seith 😀 And welcome new Xbox friends! Hi! What do you think so far? I think it is great. I got to the top of one area where I meet someone can help me to find my love. Tilo’s expressions while standing are incredible. I love the animations, it feels so “raty”, cute indeed. The only thing it is that I feel a little bit lost from time to time, but I think it is matter of time to get used to this little “open” world. I got two maps so far! Hi, I have been playing the game for 2 hours and I love it! I feel it is really beautiful. My Xbox downloaded the game while at was at the office so when I came back home I started playing right away. The game is legitime impressive, visuals are great, I disable the “focus” effect when I got out of the jail in the open door area, I felt the background was too blurry, and by changing the video option improved. I am blown away thinking this is 45% of the final product. So far I feel it is an incredible game preview, one of the best I have played. When I finish it I will post more comments. For now, I just wanted to make clear that I started playing it, I like it, and I feel it has a good future. Thank you BlinxESP for sharing your enthusiasm with us! It’s very much appreciated! I guess if, as an Indiegogo supporter of “Ghost of a Tale”, I could “switch” my pc version of the game to a Xbox One version when it will be released. Hi Emanuele. Sure, please send an email to contact@ghostofatale.com (from the email address you used during the Indiegogo campaign) and I’ll send you an Xbox One token. Hi there. First of all congratulations because this is superb news! One thing though, isn’t there a trial version of the game? Usually with Game Preview there is a trial. 🙂 one of the things I love about Game Preview. Thanks! Yes, there should be a one hour free trial. I’m in touch with Microsoft about the issue! Wow! Just bought it now for xbox. When i first saw the trailer, i say to myself “i need this game, because it´s beautiful and looks incrediable” and the day come. Thank you Denis! You’ll see, the next build will fix many bugs and improve things considerably. There might very well be an Xbox One X version of the game, who knows! I suspect it would feature a better resolution, textures on-par with the PC version and probably double the framerate of the Xbox One. Any chance that Ghost of a Tale will be release on the Australian Xbox store? Very interested in the game but can’t get it at the moment unless I buy a US gift card. Which I will probably end up doing eventually if it doesn’t release locally. Yeah it’s strange that MS forgot to add this. Yesterday the game wasn’t added yet to the Game Preview section and now it is, but still no trial. I am fairly sure this game is for me, but i love thst Game Preview always has a trial. I need 5 minutes with this game to know if it’s for me. I guess it can take some time but it’s definitely quite annoying. Usually they always add a trial. Hi Rob. Sorry to hear about the bugs you’re encountering. Unfortunately you might have to quit the game and then restart from scratch (“Start New Game”). This was a bug in the 4.0 version which is already fixed in the new upcoming build (4.36). You will have to be careful when you pick up the key: just don’t die before you open the metal gate with it and then hide and save. After that you’re good. Again, I’m very sorry about this. What i do want to say from the outset, is the world is extremely inviting. The notes Tilo finds, and you can read, really give you a sense of place, even though you’re stuck in a prison. I mentioned before the games release on XBOX, how the world felt like a novel; and it doesn’t disappoint in that regard so far. There’s a real sense of build up and i just want to plough on through, but i have to resist and savour the experience. When i’ve finished, i’ll give a full review. But unless Tilo turns into a homicidal vermin beast that cuts everyone down leaving Rat blood all over the castle walls, i can assure you i will have nothing but glowing praise. And again, believe me, the next build will make it an even more enjoyable experience. Damn, so not only is MS taking their sweet time with adding the trial but also the new build? Hope they get on with it. As the Green Flame disperses, and Tilo wakes up in his cell; the distant dream of his wife’s voice drifting out of earshot, i was under the story’s spell. Granted, I saw this opening a few times watching playthroughs on PC before the Xbox Game Preview Release, but finally experiencing it myself was so much better. Lights out, headphones on, I dived in like I would any greatly anticipated novel. And like a good novel, I found myself unable to tear myself away. I made myself after a time, as I didn’t want to rush through the game and risk not soaking everything up. There’s a line in the movie Hellboy, Agent Myers telling Liz Sherman that, “We like people for their qualities, we love them for their defects.” That was my first impression on playing Ghost of a Tale. The game does things that will undoubtedly lose it a certain audience. Firstly, the main protagonist, and everyone else, are small animals. Tilo himself is cute as hell, and that will put a lot of people off. If Lord of the Rings starred the cast of Watership Down, i doubt it would have been half as popular (Many would say that Redwall already fills that gap). It also confines itself to a relatively small area, which will, again, in a time of vast open world gaming, make people feel they’re not getting what they deserve. But sometimes a thing is sweeter when it’s not understood by everyone else. I Love this game for what it is. A beautifully realised story of a small mouse on a quest to find his wife, escape from Prison, and deal with the myriad odd characters that he needs to cooperate with in order to accomplish this. Dwindling Heights is a pure pleasure to explore. It is a perfect piece of level design that invites you to scour every nook and cranny. Using a Metroid like trope of locking away certain areas until a specific task is completed or key is found, so that you can finally open that creaky door and continue the story. I am so glad there is very little to distract on the HUD. Though a map is available if one finds them, the great fun of the game is finding your way around the Keep by simply revisiting the different areas; eventually even finding shortcuts. Though only five characters are available in the Preview, I find myself revisiting them a joy. My favourites are Gusto & Fatale, two characters that need their own DLC someday. The writing, and especially the humour, shine through. It doesn’t bother me there are no speaking parts. I actually believe that the delivery of some of the funniest lines would be lost when spoken through a voice. There is enough mystery in the story so far to pique my curiosity for the wider world. What really is the purpose of the Green Flame? What is Silas’s Secret? What is down in the catacombs? Why did Sieth use Spiders when I HATE the things. Truly, I dreaded entering Dungeons in Skyrim and seeing the webs and hearing that awful clicking sound in the distance. Another great addition is the night and day cycle. You don’t actually notice its importance at first, but like the rest of the game, it reveals itself in layers. When I first got to the court yard it was dark. I couldn’t see a thing. The only reason I knew the Rat Guards were about was the clanking of there armour. At dusk, the Keep is swept with black and reds bleeding over the walls. Morning appears flesh and daylight, well, then you get to see the Keep in all its beauty. And obviously I mean beauty in a graphical sense as, it being a prison, it is far from a beautiful place for our little mouse stuck inside of it. I also got stuck one time in the dark coming back up from the sewers, having run out of candles and my Lantern run out of oil, as the door into the jail was shut, and as there was no illumination, I couldn’t highlight the doors handle, and therefore had to go back and find some candles, getting snagged on one of the floor traps in the process. A nice little touch, making the collection of candles and keeping your lantern topped up with oil more important than mere looking around. I’m in all the way. The final version cannot come too soon for me. I want to know more about the Green Eternal Flame? Will Gusto & Fatale escape? What is Silas up to? Does Faustus Rott really have Tilo’s best interests at heart? What’s behind the Distellery Doors? I want to see the Armoury Room too. Do I have anything negative to say. No. If there are suggestions I have, then they are purely personal tastes and are not a reflection on this sumptuous game; and that I will leave for another time. Now if you’ll excuse me, i have a suit of Armour to find and flying bugs to catch. For that i’ll wait until nightfall; Both in the game and in real life. Hello Lee. Well I don’t know where to start! Thank you so much for taking the time to write to us. Your thoughtful message put a wide grin on our faces. And I didn’t even mention how great it is handling Tilo; so smooth and realistic. Or the wonderful way the Lore gives you a glimpse into the wider, unseen world beyond the Keep. I especially enjoyed reading the Journal unveiled by collecting Merra’s Roses. Tilo has an existence beyond the confines of he games setting, which is a rare feeling in a game. And who is Willem Stout? I’m on my second playthrough, after checking the statistics after my first and seeing I had only completed twenty of the twenty eight quests, I wanted to dive back in from the beginning. I’ve clocked in 16 hours of gameplay so far. Well done to all of you. You’ve created something truely special. The trial is up and its already over for me, because I went through that trial waaaaaay too quickly since I take my time. It’s lovely though. On one hand I want to wait until this game is completely finished with all the content you intend to put in it and so I can properly play and finish it but on the other I don’t want to wait anymore haha. How much quests are there in it right now would you say? The game preview version has 28 quests. Hi. Will this game appear in the Russian store? Hi DS. That’s a good question. I’ll try and ask Microsoft. Are other Game Preview games available on the Russian Xbox store? If you want, Seith, i can do translate game to the russian lang, no probs! Waiting this game to appear in Russian xbox live! Hi Dan. You’re right, the old build that is currently up on the Xbox Store is not the one we would have wanted to go live. Alas there was no alternative. Microsoft will put the new build online as soon as possible. With the game we are really asking a lot of the Xbox One. We might add an option for unlocking the framerate later on. That would allow the framerate to fluctuate between 30 and 50fps (roughly). So much more discovered on my second Playthrough. I found the key to the distillery! Could have sworn it wasn’t there before. Finding all of the Fate Cards was the hardest collectable by far. This time, once i’d collected all the pieces for the Armour, i went out of my way to talk to all of the Guards. After realising that they’ve received just as much a prison sentence as the creatures behind the bars by being sent to Dwindling Heights, i kind of feel sorry for some of them. Encountered my first issue. There is no three headed Acorn anywhere to be found. Is this addressed already in a later update? I let my little boy play a little this time ( “The Rat Game” as he calls it), He just likes dressing up as a pirate and going up and down the basket to the Tower and picking the carrots out of the garden. He also likes scurrying away from the guards and hiding in cupboards. Indeed, the 3 headed acorn is bugged in the old build. If you must know it is actually UNDER an oak tree. Unfortunately I mean right under the trunk! But that’s been fixed already and the upcoming build with take care of the problem. Sorry about that! Hi! I really glad that I can finally play this game! I have just played about 2 hours but I can say that the game looks gorgeous! I really love the “footnotes” I can see the great effort put in the Lore of the game and that makes me want to now more about Tilo’s world. I just got face a issue a couple of times… whem I load the game the comands to crouch and to sprint didn’t respond, than I have to load an older save to fix it, my luck is that I save a lot. Thanks for the great Game! Can’t wait to see what lies ahead! And one Question, what languages will be in the final game? I’m from Brazil by the way. I completely agree Diego, the hints of the wider World are great, and in this preview there is just enough to keep you wanting more. I’m sure in the finished product they’ll be lots more Lore to peruse over. Hi Diego! I’m glad you like the game! Regarding the issue you mention: it shouldn’t happen anymore on the new build but I’m not sure if you’re on Xbox One or PC. We don’t have the final list of all the languages yet but the game will definitely be translated to Portuguese. Thanks! I am playing on xbox One, so the new build wasn’t updated when I face the issues I mentioned. Now that the game has received the update in the Xbox One has never happened again. Congratulations, Seith! I’ve been waiting for this game since the first trailer in 2014. It’s so awesome to hear it has finally launched on Game Preview. I do have a few questions, though: First, does the final build have a release window yet? Also, do you have plans to port it to Xbox One X? I think it would be so cool if you could make an Xbox One X port. The game deserves nothing less. Thanks for all your hard work. Cheers! We’re thinking of an Xbox One X port, yes. It would allow for better resolution, textures, and framerate. Basically would bring it to parity with the PC version. Still have to ask Microsoft for the dev kits though! Understood. Good luck, Seith! Thanks again for your dedication to both your work and fans! So, I downloaded this game the day it was available, after looking at some screenshots of it. I must say, it is so beautiful, a few people who saw me playing thought it was a computer animated movie! Not only is it beautiful, it is also really fun and funny, with some touching moments thrown in (like learning what the little mouse sculptures represent). I had been thinking recently, every game I have played for some time has involved killing, it is hard to get away from, but getting to explore as a mouse in a rich fantasy setting, using stealth (and a few bottles here and there!) was a breath of fresh air! I really can’t wait until the game is totally finished, I don’t think I will play anymore until then, I want as much to be new as possible. Thanks Seith, and the whole team for giving this long time gamer such a new and great experience! Oh, by the way, I am a sculptor, and plan on making a sculpt of Tilo, style wise, he reminds me of characters I used to sculpt when I was starting out, it would be fun to sculpt in that style again! I downloaded the preview on a whim, loaded it up…and didn’t leave my xbox for hours. The moment the hour-long trial ended I bought the full preview. This game is incredible – fluid and enjoyable to play, intuitive (using a stool to reach things as you’re so much smaller than the rats…so simple but so satisfying! ), and the level design absolutely wowed me. I love the way the level slowly unfolds as you play and you find shortcuts back to familiar places (my favourite being the beam walkway in the ceiling of one of the corridors of the courtyard). It’s a game that generously rewards the explorers, which is right up my alley. It’s also absolutely mind-bogglingly gorgeous, and the attention to detail in the lore and collectables is astounding. I thought that the change in tone when you put on the full armour set and can talk to your would-be persecutors was great. I also loved the responses you get from characters depending on the circumstances – notable examples were Silas’ anger when he found I had taken his spyglass, and speaking to Fatale when she couldn’t get to sleep at night. I only spotted a couple of bugs; first, something weird happened with Kerold and he was no longer sitting on his stool. Instead he was hovering a few inches in front of it in a sitting position and his chains were doing wild cartwheels in the air. He still “worked” just fine – it just looked odd! Also, it looks like the candles aren’t depleting in the XboxOne version…though maybe that’s intentional. I definitely think that illumination items need to last longer in the full game! I seriously cannot wait for the full release and I’ve instructed all of my friends to download this “Thief meets Secret of Nimh” masterpiece. Great work guys. We’ll take a look at those bugs and hopefully they’ll be fixed in the next release. Hello. Wonderful game so far. 🙂 Love everything about it! I was just wondering how far the 4.43 release goes in the story. I got the armor and the orders from Silas, but I can’t find the west gate. Is this in the game yet or is this the end so far? Search enough and the truth reveals itself. Found the West gate. 🙂 Can’t wait for more! I just want to play the game when it’s finished, sorry not into testing for bugs, etc. I did buy it simply to support the development of it as I think it’s a unique little tale. The same 🙂 I wonder how long game it’ll be. I play pre-realise 10h and i count for +10h in official launch. When is the extension available on the Xbox 1?